The 2019 Bartlesville Sports Hall of Fame Class was officially introduced on Wednesday evening, as the Bartlesville Sports Commission had its annual meeting at the BHS Hospitality Room. The 2019 class is comprised of a coach, two individual athletes, a team and a community inductee. The coach, Sid Burton, a College High graduate who returned in 1958 to begin a sparkling coaching career. He won the first Bartlesville basketball state title in 1967 in an upset over heavily favored Oklahoma City Douglas, 74-72. The first athletes is Mike Coast, a 1977 Sooner High grad, two time shot put state champion and All-State selection in football. He played football at OU as a linebacker. Another athlete inductee is Amanda Warehime-Hancock, the Oklahoma Track and Field Gatorade athlete of the year in 2001 at Bartlesville High. She is a current assistant track and field coach at BHS. The team this year, the 1991 Bartlesville High girls cross country squad, which won the first of many cross country state titles at Bartlesville. And the community inductee is current Bartlesville Examiner-Enterprise Sports Editor Mike Tupa, who has been in Bartlesville since 1996, his sports coverage has earned a number of Oklahoma Press Association Awards. Chairman of the induction committee Tim Bart, talks about this year’s class. 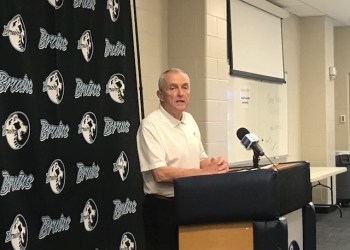 In addition to the Hall of Fame inductee announcements, Commissioner of the Great American Conference Will Prewitt attended the meeting to thank the BSC for its work on the GAC basketball tournaments over the past eight years. He echoed his sentiments from earlier this month, that the GAC’s partnership with Bartlesville was a successful one. The official induction ceremony for this year’s 2019 Bartlesville Sports Hall of Fame class will be on Oct. 26 at the Hilton Garden Inn.